Wales assistant coach Shaun Edwards believes the side has more to give as the Six Nations rugby leader. "Hopefully our best," Edwards said. 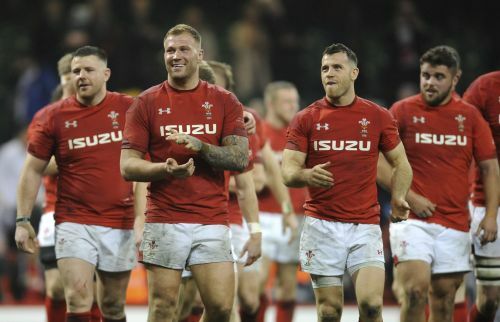 Wales is the only unbeaten team with two rounds to go. Wales faces Scotland this Saturday at Murrayfield, the finishes at home against Ireland. "It's a while (2012) since we have actually been three (wins) from three, but we are fully aware of Scotland's threat," he added. "A couple of their players have said they don't feel they have been at their best so far in the campaign, and we feel that we are still improving as well. And we would like to think the longer we have the players, the better we get. "They will probably challenge us ball in hand probably more than the three teams (France, Italy, England) we've had before. We are fully aware of the potency of their two halfbacks — they are very experienced — and the speed and class they've got on the outside." Scotland looks like having both halves available after flyhalf Finn Russell returned to training on Monday with scrumhalf and captain Greig Laidlaw and the squad. Russell was concussed while playing for his French club and missed Scotland's trip to Paris more than a week ago, when it was well beaten by France 27-10. Along with Russell, a swag of forwards also overcame injuries, including WP Nel, Hamish Watson, Sam Skinner, and Grant Stewart. Matt Fagerson and Byron McGuigan, who missed out on the initial squad through injury, and London Irish prop Gordon Reid also came in. Lock Jonny Gray said the review of the France defeat was painful, but their confidence wasn't shaken. "It's very disappointing to lose but the manner we lost wasn't us in a lot of ways," Gray said. "But we get to bounce back this week against Wales, who are absolutely flying. So it's a very exciting challenge, and it's good to be back at Murrayfield. "There's a huge belief there (in the squad). The best thing to do is get back in training, and train well."